The September 25th launch of Mists of Pandaria is quickly approaching. 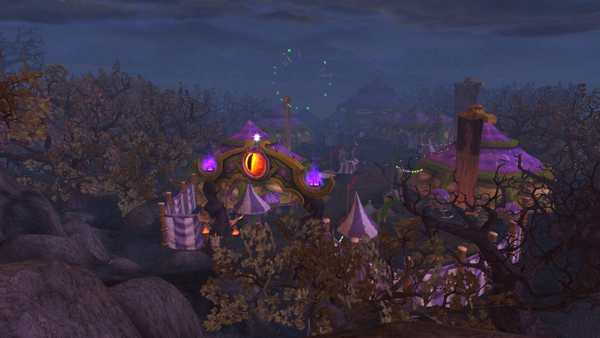 In fact the next time that the Darkmoon Faire comes to town MoP will be here. So here’s a quick rundown on making a collecting the latest level of Darkmoon Cards. The Light Parchment is easily obtained from any Inscription vendor. Starlight ink is the rare ink made from milling Pandaran herbs. It takes two Misty Pigment to make one Starlight Ink. So far the drop rate has been approximately one Misty Pigment per stack of 20 milled herbs. That drop rate may change before going live. Starlight Ink is also used in many other Inscription items like the BoA Staves, Epic level shoulder inscriptions, etc. 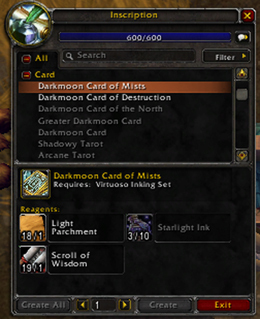 (It may be more profitable for scribes to use the Starlight Ink for Shoulder Inscriptions, making Darkmoon Cards even more rare). Also Ink Traders do not handle Starlight Ink currently on the beta. We’ll have to see what happens when it goes live. Scrolls of Wisdom are made during the Scribe’s daily research and have a one day cool-down. Obviously scribes will not be mass producing these as they have in previous expansions (They are gated by the availability of Starlight Ink and a day long cool-down on Scrolls of Wisdom). Add to that the fact that when a scribe makes one of these they get a random card, not a specific one. Collecting the ones that you need will take a long time and a lot of gold. At least during the early phases of the expansion. To create a deck to be turned in at the Darkmoon Faire you need to have the Ace through Eight of the suite that you are collecting. There are a total of 32 different cards that make up 4 decks. When you turn in a deck you are rewarded with an iLevel 476 trinket. Tiger Deck (A-8 of Tigers): Rewards you with a Relic of Xuen (Melee DPS). There are two versions of the relic; one with Strength and another with Agility. Be careful when you select one. Ox Deck (A-8 of Oxen): Rewards you with a Relic of Niuzao (Tanking). Crane Deck (A-8 of Cranes): Rewards you with a Relic of Chi-Ji (Healing). Serpent Deck (A-8 of Serpents): Rewards you with a Relic of Yulon (Caster DPS). Turning a deck in will also net you 350 reputation with the Darkmoon Faire. A little over two weeks to go until launch. I can’t wait. Where can I go to have the upgrades done on one of these trinkets? The upgrade guy in your faction’s city. For the horde that is on the second floor of the Shrine of Two Moons, near the transmog and void storage guys.